Samsung Galaxy M20 and Galaxy M10 are now in the news. While the tech world is primarily anticipating the Galaxy S10, Samsung is also reportedly building its all-new Galaxy M series. The new series should bring a fresh design to the company’s current lineup, and is likely to debut in the coming future as details about two rumoured Galaxy M-series smartphones have now surfaced. The Galaxy M20 could be the company’s largest battery-featuring smartphone with a 5,000mAh unit. This is notably 1,000mAh more than the 4,000mAh battery available on the Galaxy Note 9. Separately, the Galaxy M10 has been spotted on a certification site. This suggests the new launch could happen anytime in the coming future. 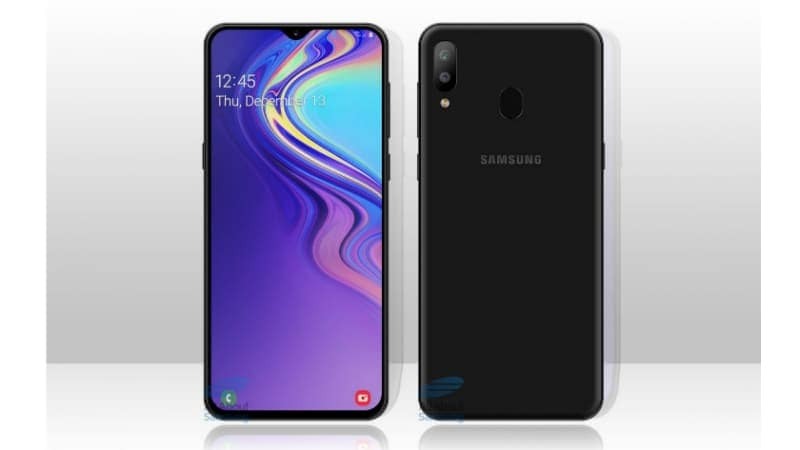 Among other developments, the Samsung Galaxy M20 that has been rumoured with model number SM-M205F will come with a 5,000mAh battery, reports GalaxyClub.nl. This is notably 25 percent larger than that of the Galaxy Note 9₹ 59,990, which packs a 4,000mAh battery. It is also said that the Galaxy M20 will come to Europe, precisely the UK, Germany, France, Poland, and Scandinavia. The Galaxy M20 is also said to have an Exynos 7885 SoC, coupled with 3GB of RAM, and sport an LCD TFT panel with a waterdrop-style notch. AllAboutSamsung has also created a concept render based on the early rumours of the Galaxy M20. The render shows the waterdrop display notch and thin bezels. Also, it is said that the handset will measure 156×74.5×8.8mm. This shows that the Galaxy M20 will be 1mm thicker than the Galaxy A8s. Samsung is also said to offer an 8-megapixel camera sensor at the front of the Galaxy M20, while its rear panel is said to have a dual camera setup with 13-megapixel and 5-megapixel sensors. In other news, a Samsung smartphone with model number SM-M105F/DS has now been certified by the Wi-FI Alliance. The handset in question is speculated to be the dual-SIM variant of the Galaxy M10, the model that would sit next to the Galaxy M20 as well as the previously rumoured Galaxy M30 and Galaxy M50. The Wi-Fi certification does show that the Galaxy M10 runs Android 8.1 Oreo and support features such as Wi-Fi 802.11 b/g/n, Wi-Fi Direct, WMM, WMM Power Save, and Wi-FI Protected Setup. Folks at 91Mobiles have first spotted the Wi-Fi certification. Moreover, the Galaxy M10 is said to have an Exynos 7870 with a base clock speed of 1.59GHz and 3GB of RAM. This could be coupled with 16GB and 32GB onboard storage options and Blue and Dark Grey colour options. Furthermore, the handset is said to have a 13-megapixel rear camera, 5-megapixel selfie camera, and a 3,000mAh battery. Samsung is speculated the Galaxy M10 sometime later this month or in early January. However, price and availability details of the new model are yet to be revealed.